Italian Americans mourn the passing of Joseph R. Cerrell, life-long supporter of the Italian American community, and former president of NIAF. His grandparents Giuseppina and Francesco Cerrella emigrated from Italy’s region of Calabria. On a recent trip to Italy, he was appointed honorary Mayor of Rossano in the province of Cosenza, Italy. Upon his passing, Cerrrell' children said that "He was a trusted advisor to his clients and political candidates. And he was a dear friend to so many. We are bolstered by his zest for life—for his love of politics, for his proud Italian heritage, and for his unyielding passion for the New York Yankees and the USC Trojans." Active in the Italian American community, Joe was admired and respected by Italian and international leaders and all ethnic groups. Cerrell worked for 16 years with the National Italian American Foundation where he served as National Vice Chairman (2005-2009), President (1999-2005), and Member (1994-1999) of the Board of Directors. A statement released by the NIAF's Board of Directors, said that "his visionary leadership and support have advanced the mission of NIAF. 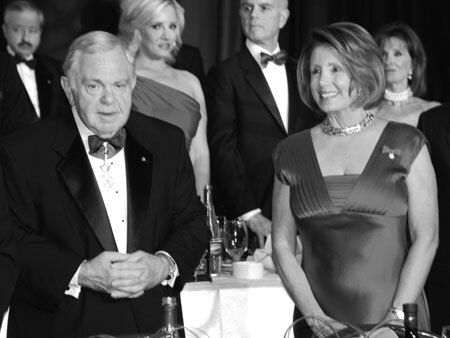 Joe's tireless efforts to stop ethnic stereotyping of any individual or group will be long remembered by all who served with him on the Foundation's Media Institute and his chairmanship of NIAF's Public Affairs Committee." Cerrell’s political career began in the 1950s at the University of Southern California (USC), where he started the Trojan Democratic Club on a campus known at the time for its Republican activism. His political savvy soon caught the eye of Jesse M. Unruh, leading to a position on his State Assembly campaign and later on the staff of Attorney General Edmund G. “Pat” Brown, running for his first term as California Governor in 1958. After Brown won, Cerrell was approached again by Unruh, who had become Speaker of the California Assembly, to run the California Democratic Party. At just 24, Cerrell was the youngest person ever to do so. That experience led Cerrell to the Kennedy presidential campaign, where he became California campaign manager, directing all operations in the Golden State. Interviews with Cerrell are part of the Oral History Project at the Kennedy Presidential Library & Museum in Boston. It was on the Brown campaign where Cerrell met the striking blonde campaign worker Lee Bullock, who would become his wife in 1963. At the time, the Cerrells postponed their ceremony by a week at the request Vice President Lyndon B. Johnson, so they could oversee a Los Angeles event for President Kennedy. Joe and Lee Cerrell celebrated their 47th wedding anniversary on Nov. 17. In 1966, Cerrell formed Golden State Consulting with colleagues Don Simonian and Chuck Winner. While their venture was short-lived, the trio would go on to achieve individual successes in political consulting. In 1967, Joe and Lee founded Cerrell Associates. Early clients included Pacific Southwest Airlines and Pacific Telephone, as well as countless political candidates. Together with political consultant Ben Palumbo, Cerrell opened Palumbo & Cerrell in Washington, DC in 1983 giving him an East Coast branch and the ability to serve clients in the nation’s capital. Over the years, Cerrell and his firm advised high-profile dignitaries on their visits to Southern California, including the 2000 visit of His Holiness the 14th Dalai Lama, and two local tours for Armenian Pontiffs—the 1987 visit of His Holiness Catholicos Vazken I and the 1996 visit of His Holiness Catholicos Karekin I—the latter earning Cerrell Associates a PRism Award for Best Special Event from the Public Relations Society of America-Los Angeles (PRSA-LA). Today, Cerrell Associates is the 43rd-largest independently owned PR firm in the United States and the 4th-largest independently owned PR firm in Los Angeles, according to O’Dwyer’s 2010 Directory of Public Relations Firms. Additionally, it is a member firm of the Worldcom Public Relations Group, the world’s largest consortium of independently owned public relations counseling firms. In 2006, Cerrell led a restructuring effort that transferred majority ownership of Cerrell Associates into the hands of its seven senior principals. He took on the title Chairman Emeritus, but remained current with the firm’s business and continued to track local, state and national politics. Born Joseph Cerrella in Queens on June 19, 1935—the son of Sal, a New York City fireman, and Marion, a campaign worker who would later work for Assembly Speaker Jesse Unruh in Sacramento—Cerrell reveled in his New York roots. He often insisted that Frank Sinatra’s hit “New York, New York” be played at family and company events. He passionately followed his beloved Yankees and was in the stands at both Dodger and Yankee stadiums during the 1977 and 1978 World Series. In 1941, Cerrell’s parents dropped the “a” off Cerrella so their son could escape anti-Italian discrimination during World War II. Later in life, he started to actively research his family’s ancestry and in 1987 made what family members called a life-changing journey to Calabria, Italy to find and meet long-lost relatives. In his lifetime, he made more than two dozen trips to Italy, often combining work with pleasure. He became extremely proud of his Italian-American heritage, energetically promoting the contributions of Italian-Americans in Los Angeles and around the world. He served as vice-chair and president of the National Italian American Foundation (NIAF); vice-chair of the Conference of Presidents of Major Italian American Organizations, and was appointed to the California Italian-American Task Force by Gov. Pete Wilson. In 2002, he received the Ellis Island Medal of Honor and, in 2007, the Italian-American Lawyers Association named Cerrell to its Hall of Fame. The Italian government bestowed several awards on Cerrell, including its highest honor, the “Commendatore al Merito Della Republica Italiana” (Knight Commander) decoration. Cerrell was a proud alumnus of both Los Angeles High School and USC, where he earned his bachelor’s degree in 1957. He would return to his alma mater in 1979 to become one of USC’s most popular adjunct professors, teaching for 15 years in conjunction with the university’s prestigious Jesse M. Unruh Institute of Politics, which he co-founded with longtime friend and fellow Unruh aide, Larry L Berg. More recently, he was a Distinguished Visiting Professor in Political Science at Pepperdine University in Malibu from 1996 to 2004. Over the decades, many of Cerrell’s students interned at Cerrell Associates, with several coming to work for him full-time—a track record that was a source of pride. In addition to teaching, Cerrell worked with political science professors from local universities to establish the Annual Sacramento Seminar, which has since brought thousands of college students to the state capital. He was also a passionate fan of USC football and for decades rarely missed a home game. Cerrell served on the boards of the American Association of Political Consultants (AAPC) and the International Association of Political Consultants (IAPC). In 2004, Cerrell received a Lifetime Achievement Award for outstanding contributions to campaign consulting from American University’s Campaign Management Institute and, in 2007, the AAPC inducted Cerrell into its Hall of Fame, calling him a “pioneer and an innovator in our industry.” The AAPC honor is recognized as the highest honor that working members of the profession can bestow upon a colleague. A sought-after lecturer and political pundit, Cerrell was well known for his appearances on numerous news and public affairs programs, where he was recognized as a political legend, considering his half-century of work in, and observation of, the local, state and national political scenes. National and local journalists knew Cerrell offered insightful political commentary and a unique perspective on California and US politics. Cerrell was frequently quoted in newspapers and magazines, particularly during election cycles. Cerrell was a product of a different age of politics, with less divisiveness and more mutual respect. He knew and was admired by people across the political spectrum. Once, at a moment’s notice, he and Republican Lyn Nofziger conducted a master class on elections at the National Press Foundation in Washington. Despite his New York upbringing, Cerrell loved Los Angeles, where he married, raised his family, ran his successful business, and built an unparalleled reputation for giving back to the community. A resident of Hancock Park for more than 50 years, Cerrell was proud to relocate his firm to nearby Larchmont Boulevard in 1980. That same year, PRSA-LA presented him with the Joe Roos Distinguished Award for Community Service, recognizing his contributions to the city. Cerrell was particularly proud of his work with the California Museum of Science and Industry (now the California Science Center), where he was responsible for getting the IMAX theatre built in time for the 1984 Olympic Games. He also worked with attorney and real estate magnate Donald T. Sterling to help bring the Clippers to Los Angeles in 1984 and was also part of the team that brought the Oakland Raiders to the Coliseum. A former president of the Los Angeles Coliseum Commission, Cerrell later helped organize the rededication of the Los Angeles Memorial Coliseum after renovations to repair damage from the Northridge earthquake. The effort earned Cerrell a 1995 PRo Award from the Publicity Club of Los Angeles. In 2008, the Central City Association named Cerrell a “Treasure of Los Angeles” for his many decades of service to the city. An example of this service was Cerrell’s longtime leadership and volunteerism with Wilshire YMCA (now the Hollywood-Wilshire YMCA), where he, along with Los Angeles City Council President John Ferraro, helped institute its annual Booster’s Dinner, establishing it as one of the YMCA’s largest single fundraising events in the United States. A well-known “foodie,” Cerrell loved frequenting Los Angeles’ best restaurants—especially Melrose Avenue’s Marino Ristorante, where he dined regularly for more than 25 years. An avid user of local restaurant guides, Cerrell was an attributed contributor to “Paul Wallach’s Guide to the Restaurants of Los Angeles.” His love of fine food even inspired a short-lived stint as a restaurateur, when he bought a continental brasserie called La Place, in Century City in 1975. He sold it four years later. He was also an investor in the El Cholo restaurants in Los Angeles and Santa Monica. Those closest to Cerrell knew that despite his deep love for American politics, Italian food, the Yankees and USC, his greatest joy was spending time with his family. He is survived by his wife Lee, of Oxnard, Calif. and Los Angeles; his son Steve Bullock, CFO of Cerrell Associates, and daughter-in-law Irina Bullock of Burbank, Calif.; his daughter Sharon Cerrell Levy and son-in-law Matthew Levy, of Sherman Oaks, Calif.; his son Joe Cerrell, Director of the European Office for the Bill & Melinda Gates Foundation, and daughter-in-law Sara Grote Cerrell, of London and Seattle; and his former daughter-in-law Tara Bullock, of Van Nuys, Calif.; along with his seven beloved grandchildren: Kimberly and Christopher Bullock, Danny and Lauren Levy; and Sal, Chase and Josie Cerrell. Additional survivors include cousins Jackie Young, Bonnie Jollett, Nancy Posner, Jeannie Posner, Michael Baer and Kathy Porsella.